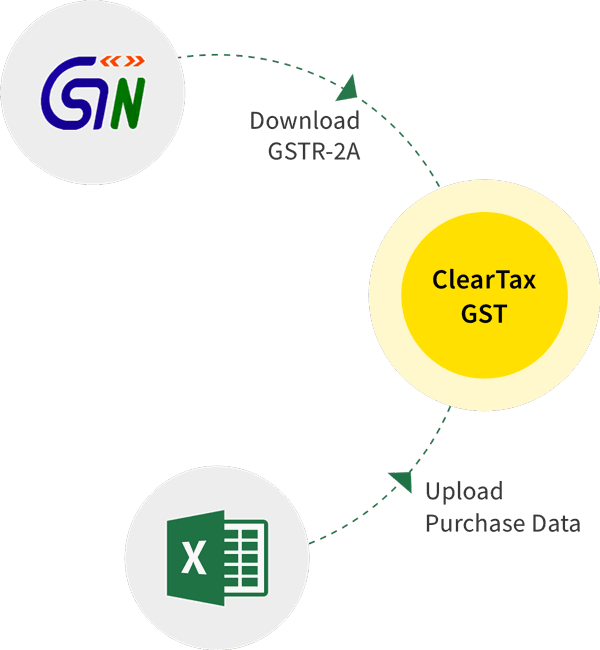 Any trade, commerce, manufacture, profession, vocation or any other similar activity can be called as Business under GST. It can either be a core or an ancillary activity whether or not involving monetary benefits. This article explains the definition with examples. Business includes any activity carried out by a person whether or not, there is volume, frequency, continuity or regularity of such transaction. Also occasional trade or even one time trade constitutes business. 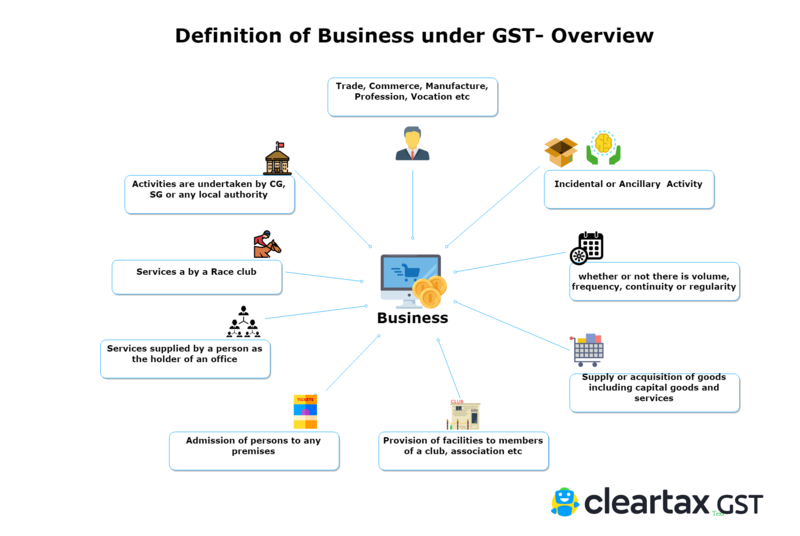 The term “business” has been defined but the phrase “in the course or furtherance of” has not been dealt with in any manner under the GST law. Anything done in relation to business, while carrying out business or simply a revenue-generating ordinary activity of that organisation/concern. For example: Selling scrap generated in process of manufacturing turbines. Purchases & Sales of spare parts by an automobile vendor. For example: Activities done as part of CSR by a Company. Hence the phrase also covers any supplies made in connection with the business. Any activity carried out by the entity in the course or furtherance of business is included in the ambit of business definition and hence will be considered as ‘supply’ under GST. Further one must check for the taxability of supply and exemptions. ‘In the course or furtherance’ is not defined, but is broad enough to cover any supplies made in connection with the business. The phrase widens the scope of Business definition to bring more activities in its ambit. Important to note that any supplies received by a taxable person used/ consumed in the course or further of business is eligible for claiming input tax credit. The phrase further enables the entity to supply and to receive supplies where the act is towards achieving the goals of the business. This impacts the eligibility to claim input tax credit. Hence, it becomes important for an entity to understand and justify that a particular act is done in the course and furtherance of its business goals and intentions. i. Banks providing financial services to its customers. ii. Company manufacturing turbines for export and local sale. iii. Provision of CA services to client such as audit and consultancy. iv. An artist earning income for dance performances. v. Gambling in a Derby. vi. Charitable hospital providing free medicines to farmers. Note: Pecuniary benefit means monetary benefits. It’s a benefit or compensation that is quantifiable in monetary terms.The primary significance of this term is economic gain by the entity. i. Provisions of lockers for rent to customers in the Bank premises as Banks have high security. ii. Turbine Manufacturing company letting out R&D facilities to research units towards improvement of product and expansion. i. Mr.X gambles for the first time in Derby and wins. ii. Sale of mangoes by a farmer during summer in flea market. iii. Sale of old newspapers by a CA firm. i. Services rendered by a Company Secretary to incorporate a Company. ii. Real estate agent helping Company to acquire factory godown for a commission. i. Cooperative society formed for lending loans to farmers. ii. Recreation club formed by apartment owners. i. PVR selling movie tickets. ii. Entry / Admission fee collected by Art exhibitions to display artifacts, paintings and sculptures made by artists. iii. Museums run by Governments for an entry fee to public to display objects of historical significance. i. Consultancy service provided by a Company CFO regarding Mergers to another company. i.Acquisition of land for Metro construction by the State Government from the landowners for some compensation. ii. Government running BBMP service for the welfare of citizens. 1. Supply of goods to an orphanage by any manufacturing company for free distribution to meet its CSR obligations will not get covered as a taxable as it is without consideration. Such distribution would be in the course of business for the company as meeting CSR obligations is ancillary or incidental to its main business. 2. A Banking company selling hypothecated assets due to default in debt payment by its borrowers is in the course and furtherance of business. 3. A turbine manufacturing company running a staff canteen is in the course and furtherance of business. 4. A non resident person Mr.X visits India as a tourist and sells his camera for Rs.10000. This doesn’t amount to supply as it is not in the course and furtherance of business. 5. A practicing CA who is registered under GST sells his personal Rado watch. It doesn’t amount to supply as it is not in the course and furtherance of business. 1. A Charitable hospital providing free medical treatment to poor patients or to farmers is also covered under the scope of ‘business’ though its not for pecuniary benefit.